Time has gone so fast this summer. I remember reading about how to get a bikini body before bathing suit season. Well HA! It’s now bathing suit season and with working out at the gym, eating pretty healthy, I still don’t feel I’m ready for bathing suit season. Maybe I will be next year? If I eat things like today’s recipe, I’ll be ready for bathing suit season in January!! This salad is so full of good things like fresh summer produce to vitamins and nutrients You have healthy carbs and fats too!! This is really the ultimate salad!! 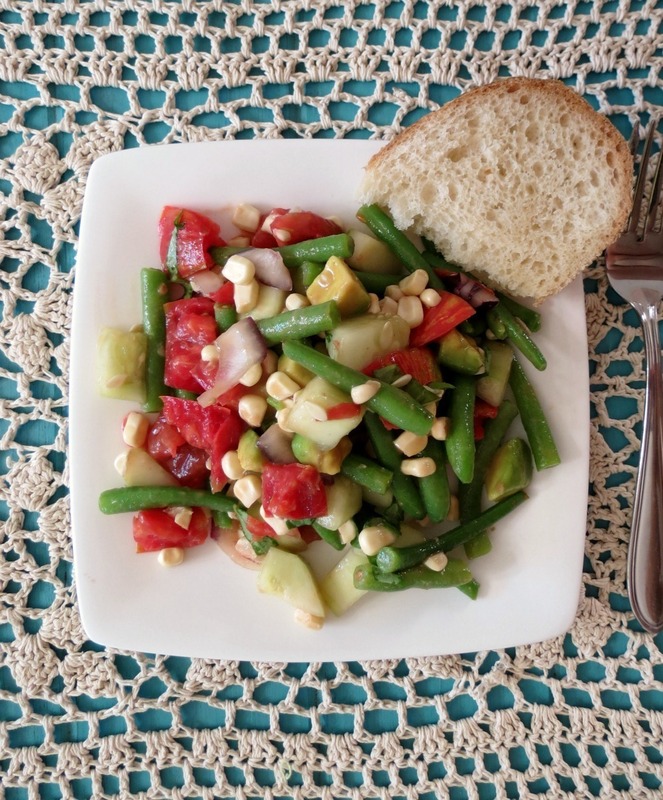 The salad is made with organic vegetables such as fresh corn off the cob, tomatoes from the Farmers Market, fresh green beans, cucumber, onions and avocado. I used my wonderful Star Fine Foods Extra Virgin Olive Oil and Stars Fine Foods Red Wine Vinegar to make a fabulous light salad dressing. Oh baby it is perfect! Not only is this salad good for you, it’s also good for the Husbands too! My Husband actually ate this salad, and the homemade dressing too! I was shocked!! Between you and I, I think he’s trying really hard to eat a tad bit more healthier. Maybe he wants a summer bikini body too? Ok, maybe a Speedo body? Just kidding, he doesn’t wear Speedos and even if he wanted to, I wouldn’t let him. But I won’t get into that conversation, since were talking about food. Ewww, Speedos!! I don’t care how hot you are, no man looks good in Speedos, ok, enough said! This salad also tastes most awesome the next day too! I had left overs so I had two heaping cups of it for lunch. It filled me and made me feel good! I think when you eat a good breakfast and lunch it really sets your day to eating healthy and maybe even getting a little workout in. Though working out these days is a struggle, but I do it, well at least 3 days a week. I have been trying to spend my time outside just enjoying the summer breeze and the sunshine. I am NOT looking forward to winter this year, but then again I don’t any year. Summer just goes way to fast, even living in California. 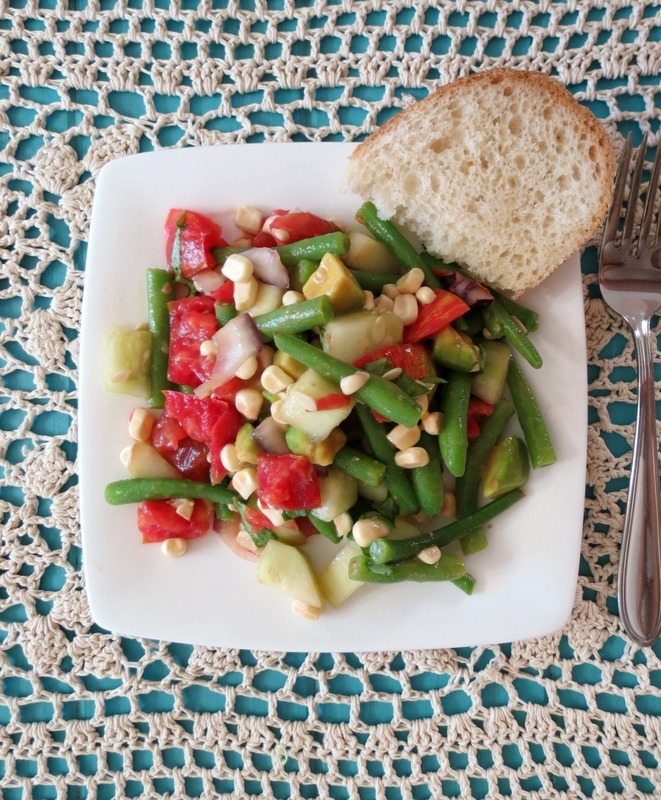 A healthy summer time salad that is vegan and gluten free and made with fresh vegetables and topped with an olive oil and vinegar dressing. In a microwave safe dish, add green beans and about 3 tbsp. water, cover, cook for 2 minutes, just to blanch them. Once done, place beans in cold water, set aside. Meanwhile add all the remaining vegetables and basil to a bowl, add the green beans; lightly mix together; Place in the refrigerator until ready to use. NOTE: If the green beans are to long, cut them in half after you cooked them. 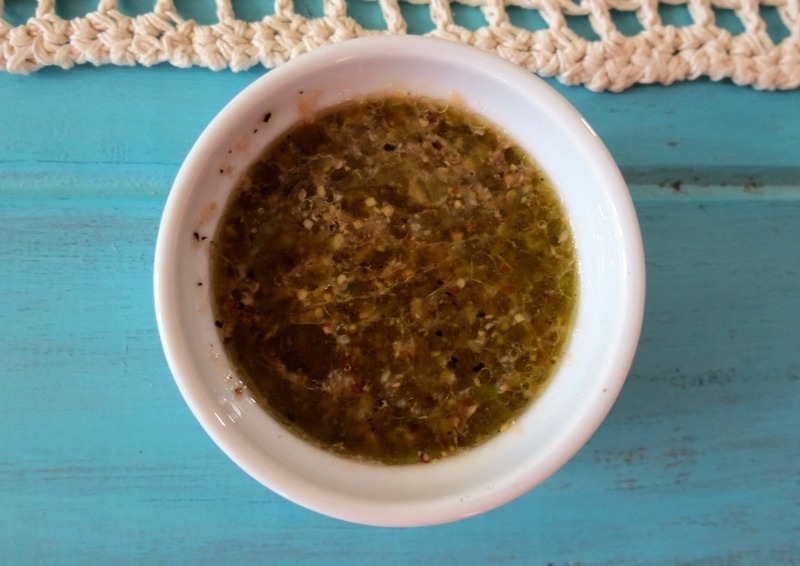 In a small bowl add dressing ingredients, whisk together or pour into a small jar and shake. You can either serve the dressing on the side, which I recommend if planning on having leftovers (just add a squirt of lemon juice to the salad so the vegetables stay fresh and avocado stays green) or add dressing directly onto the salad and marinate for about an hour for maximum flavor. 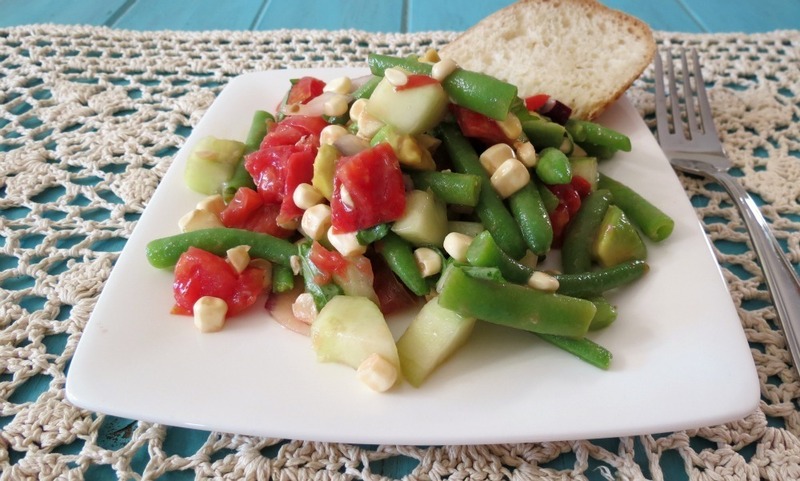 I hope you like today’s recipe and it inspires you to get your favorite summer time vegetables and make a salad of your own. Nothing tastes like produce that is in season. Enjoy the summer tomatoes and corn. They are just most excellent this time of year. My window sill is loaded with tomatoes. I like to cut them in half and sprinkle them with some salt and eat it. It’s so good! Ohh, I am already missing tomatoes. I think I am going to can them this year! I just need to talk my Husband into helping me. It’s such a long process and I hate to do those kind of things alone. Maybe if he reads this he will want to help me? Are you canning tomatoes or any produce this year? If you have some good recipes, link them below. I haven’t canned tomatoes in like 15 years and I need a refresher. Well my friends it’s time for me to get going. I will be going on vacation in a couple of weeks and I need to start prepping and planning my recipes now, otherwise I end up in a panic and I want to be sure I give you some good recipes. So hmm, what should I make? Such a lovely salad! I cannot get enough fresh summer corn right now! I know me too! It tastes so good this time of year!! This salad looks so scrumptious and colorful, Jennifer! I’d love to try it! 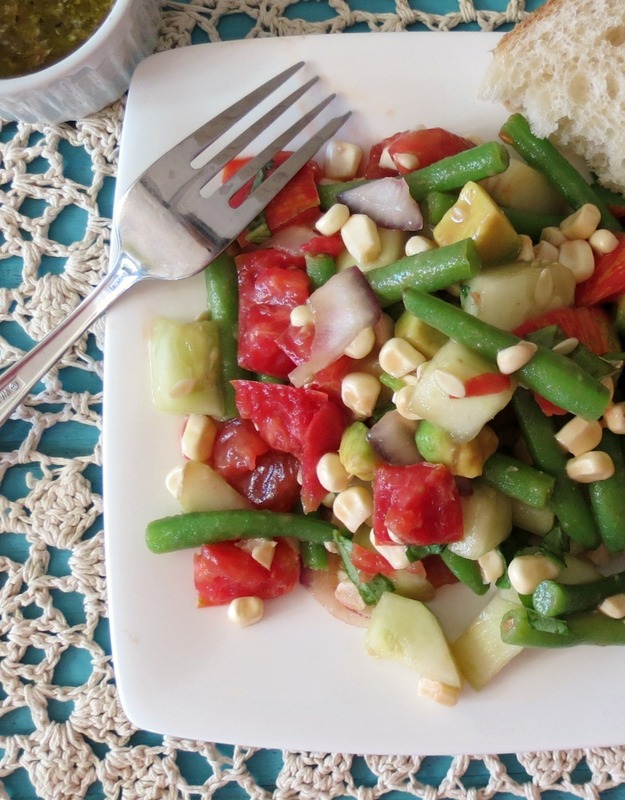 This is the perfect detox Summer salad! Light and refreshing-sounds and looks fantastic! Thanks Laura! I love these kind of salads, so simple and fresh! This looks so fresh I can almost taste it! I also LOVE farmers markets. As for a bikini body maybe next year, I think the fitness will take me there for sure! Sopfia, I love the recipe you posted today! I am so going to make mushrooms with ground beef tacos! I can’t believe I am going to buy mushrooms. 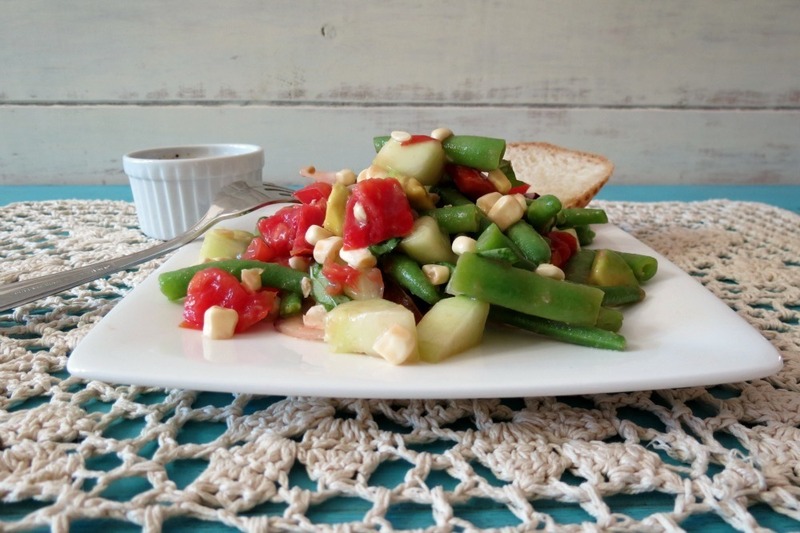 sounds like a great healthy summer salad! Thanks Dina! I love all of the summer produce right now! I can’t get enough of it! Thanks Lori, let me know how you like it.